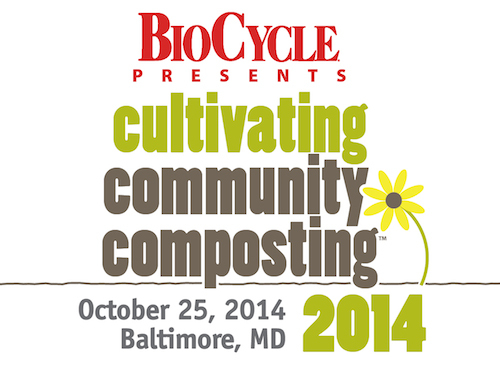 ILSR is pleased to announce — along with co-organizers BioCycle and Civic Works — the second national Cultivating Community Composting, a day-long forum (10:00 AM-4:30 PM) on October 25th, 2014 in Baltimore, Maryland. Like the first forum (held in Columbus, Ohio), this event will bring together composters to network, share best practices, and build support for community scale composting systems and enterprises. The second national Cultivating Community Composting Forum is being held at the Rita Church Community Center in Baltimore, Maryland’s Clifton Park, where Civic Works’ Real Food Farm is located. The forum will address a range of topics, including composting methods, permitting and financing, training, bike-powered collection, integrating composting into food production, and community engagement. The fee to participate is $35 and includes lunch and a tour of the Real Food Farm’s on-site composting and farm. Community composting programs range from urban to rural and include demonstration/training sites, schools, universities, pedal-powered collection systems, worker-owned cooperatives, community gardens, and farms employing multiple composting techniques. Many but not all are non-profit mission driven enterprises. Their distinguishing feature is keeping the process and product as local as possible while engaging the community through participation and education.